This pattern was requested by several Crochet Spot readers! 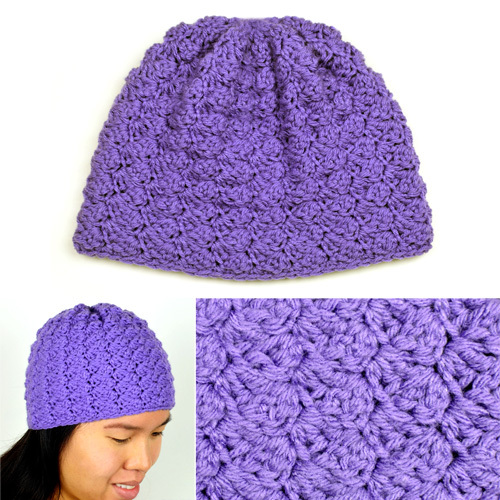 If you’ve crocheted any of the crochet patterns in the “cozy” series, here is a hat to match! The Cozy Shawl Wrap with Pockets, Cozy Key Hole Scarf, Cozy Asymmetrical Poncho, and Cozy Hooded Poncho all use the same “cozy” stitch pattern. The cozy hat is designed using the same stitch to match these patterns. It is crocheted in the round, from the top down. Whether or not you are crocheting the hat to match another item, you can crochet this hat in any of the 5 sizes that are included: baby, toddler, child, adult, and large adult. This entry was posted on Monday, October 23rd, 2017 at 1:52 PM by Rachel Choi	and is filed under Best Crochet Patterns. You can follow any responses to this entry through the RSS 2.0 feed. You can skip to the end and leave a response. Pinging is currently not allowed.